Zelda recounted early days, before there was trust. Clarence quickly learned “her” name was Robbin Carroll, yet it would take Robbin two years to be let in in that way. Robbin’s career in instructing yoga and mindfulness in instances of trauma and violence had led her to the schools of West Englewood in the South Side of Chicago. 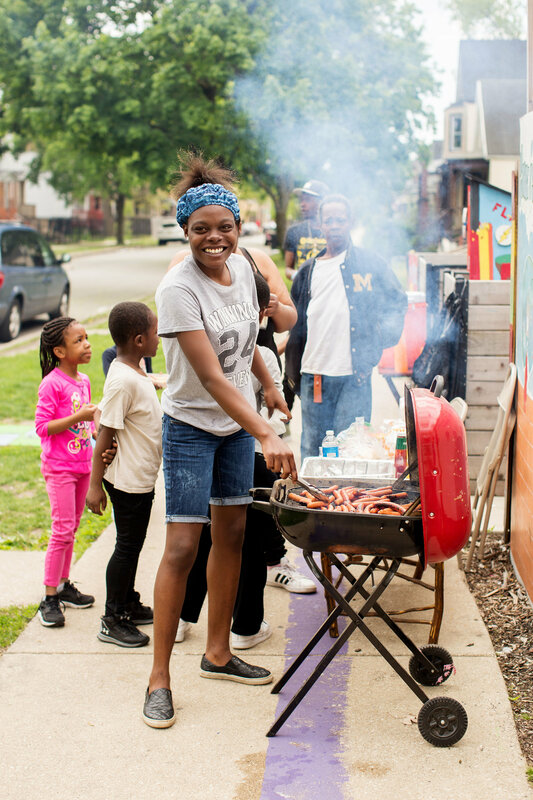 In her early work there, she witnessed the traumas inflicted by neighborhood violence and countless systems failing to protect this 5-block community. Robbin’s intention was relief for kids in West Englewood—fundamental, emotional relief. Robbin was coming to know a community that didn’t feel safe—in their streets, in their movements, or at times of rest. Each passing day Robbin worked with her students she realized more and more that so much of the trauma they were addressing was occurring outside of the school day. It wasn't a surprising notion, but witnessing it day after day prompted her to take action. In an approach that became a creed, she showed up to her corner of the World. “I’m thinking of buying a house and making it a Peace House. What do you think?” she asked. It would be a safe place in West Englewood to address the traumas accumulated over time. It would be a place for yoga or a warm meal. It would be a place that never turned anyone away. It would be a place for hope. She pointed to the abandoned house she had in mind, just down the street. Quentin Mables lived just a few blocks away. He passed Robbin, heard her message, and decided to take action. A few minutes later, he took a trash bag from her hand and started collecting trash on the street he walked every day. 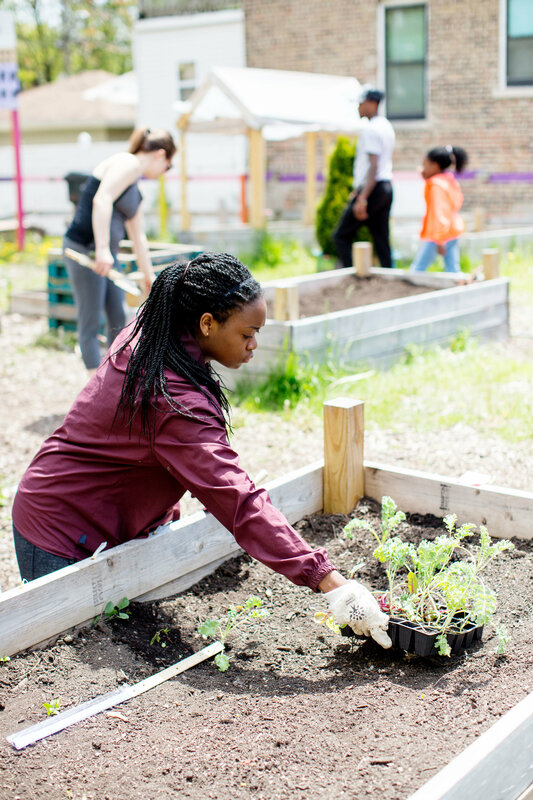 The seeds of I Grow Chicago were planted. This relationship between big ideas and a “task at hand” mentality has come to define I Grow Chicago’s approach toward their five-block community. Before the house was purchased, before 501(c)3 status was obtained, there was trash to pick up. The decision to first pick up the trash has echoed ever since. Years later, the Peace House has been realized and has come to represent even more than they had hoped. I Grow Chicago regularly operates 15 programs (all led by members of the community) that further their mission: “To create an environment of connection and belonging in order to foster wellness, justice, and dignity for all.” On any given day you’ll find yoga teacher training, police-community hearing circles, community gardening and more. 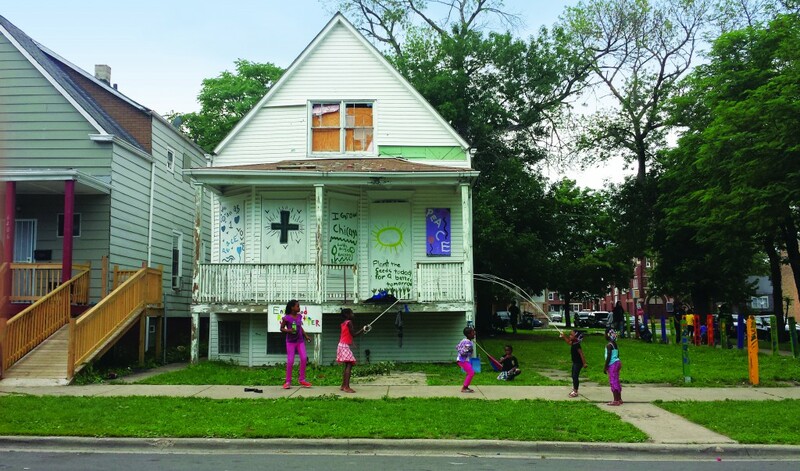 It’s important that the Peace House doesn’t look or feel like any of the institutions the West Englewood community is used to, according to Zelda. “This community has been burned so many times—by police, by churches, by schools... these institutions that are meaning to help people, but in this community, have often become another source of trauma,” said Zelda. The better these institutions understand the individual, and the better the individual understands how to navigate the institution, the better off everyone is. I Grow Chicago doesn't look or feel like an institution West Englewood is used to, but working with those institutions is key. 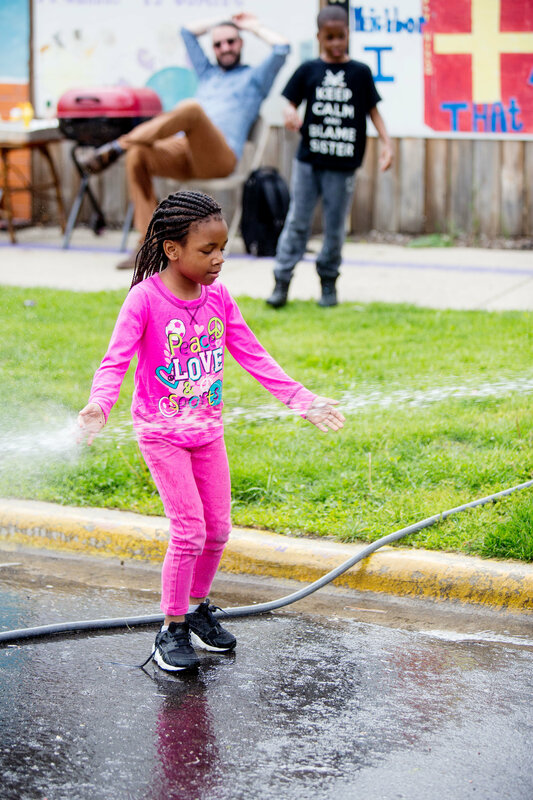 One of their goals is to connect their neighbors to the right resources while helping these institutions better understand the community itself. "We host monthly police-community dinners, juvenile justice workshops and healing circles, and we work with individuals to navigate the systems they need to... We fill out health insurance applications, SNAP applications, completing their GEDs, figuring out child support, advocating for their housing rights, etc." said Zelda. "We don't look like an institution, but we need to understand the institutions and help our community understand them." “We consistently show up, we remember their birthday, and they know they matter. That builds hope,” said Zelda. Their message: Find your corner of the World. Show up for it, and meet it where it is. Everyone can do this kind of work because this work happens everywhere. I Grow Chicago knows the needs of the community are complex and always changing. Regular programing introduces consistency and accountability, but the most notable thing I Grow Chicago might do is put down the clipboard. Regular attendance matters, but it matters far less than a neighbor standing in front of you in need of a warm meal. It also matters less than a family seeking shelter for their belongings after losing their home due to a missed payment cycle. It doesn’t matter why the payment cycle was missed. If it did, and you asked, you’d learn that switching from bi-weekly payments to monthly payments all at once is harder than it sounds when cash is tight. What matters is that a neighbor feels safe enough to rest, and seen enough to ask for help. “That’s not a specific program. There was a need. And we responded to it,” said Zelda. At I Grow Chicago, long-term goals will always be balanced with the short-term practice of solving the problems and celebrating the individuals right in front of them. “I made it to fifteen!” Zelda has heard, finding herself disheartened by the fact that that's thought of as an accomplishment. In the face of such hurdles, Zelda and the I Grow Chicago community resolve to celebrate each community member, each milestone, each day. I Grow Chicago is a Daymaker partner located in the South Side of Chicago. They use Daymaker to enable donors to send birthday and holiday gifts to the amazing kids they spend time with every day. Personalized gifts purchased by donors arrive to the doors of the Peace House, ready to put a smile on the face of a kid in need of a lift.